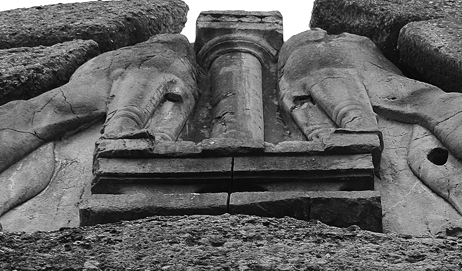 This article considers the stoneworking techniques and implements that were employed in the production of the Lion Gate relief at Mycenae, as deduced from tool marks preserved on the sculpture. Examination of these traces has revealed previously undetected details while highlighting the indispensable roles of tubular drills and saws—especially a large pendulum saw and a smaller convex blade—in the manufacturing process. A new illustration of the relief depicts the location of all discernible tool marks and other minute features, most of which are hidden to the on-ground viewer. The analytical conclusions from this investigation substantially advance our understanding of the monument’s construction. The date of the relief and sequence of its production, as well as unexpected evidence for repair during the Bronze Age, are now clear. Moreover, evaluation of the extant tool marks suggests that the relief’s composition should be reconstructed as heraldic lions turning their now-missing heads backward. Finally, this article argues that specific stonecutting methods evident on the relief have strong parallels in central Anatolia, so the prospect of Hittite and Mycenaean interaction, particularly on a technological level, is appraised.